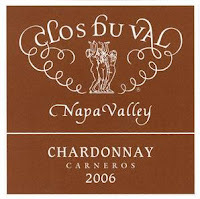 The 2006 Clos du Val Chardonnay is made from 100% Napa Valley fruit from the Carneros appellation. It was aged for 10 months in French oak barrels, 20% of which were new. On the nose it brings forth aromas of baked apple pie, pear, lemon peel, toasted oak, and some subtle tropical fruits. The flavors follow suit and show consistent notes of citrus peel, butter, toasted oak, and caramel apple. The finish is very long and complex but does show a hint of alcohol. I did taste this wine at close to room temp so I think if chilled a bit the alcohol would subside on the finish.